Once people get there, Mars will be contaminated with Earth life. Cassini's 'Grand Finale' ended with the spacecraft burning up in Saturn's atmosphere. 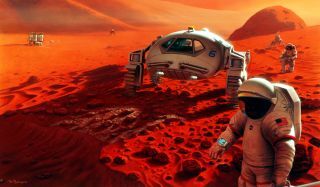 But players both public – NASA, United Arab Emirates' Mars 2117 project – and private – SpaceX, Mars One, Blue Origin – already plan to transport colonists to build cities on Mars. And these missions will contaminate Mars.